Make the bathroom feel like a spa with this high-pressure showerhead. 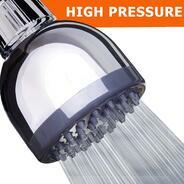 The SomovWorld High Pressure High Flow Chrome Showerhead boasts eco-friendly, high pressure showers. Featuring self-cleaning nozzles and easy installation, this showerhead is a major upgrade at a minor cost (only $21.99). 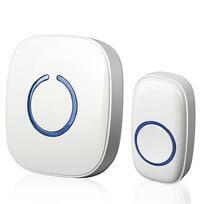 Add a doorbell without any hardwiring. Though very basic, a doorbell is a nice feature to have, especially for those who like to entertain. The Sado Tech Model C Wireless Doorbell operates at over a 500-feet range with over 50 chime options to choose from and adjustable volume. Plus, it is only $16.50. Upgrade your cabinets and drawers with sleek looking handles. It’s amazing what a difference cool handles for drawers and cabinets makes, and how cost effectively it can be done. These Homdiy Brushed Nickel handles are easy to install and only $8.48 for a pack of five. 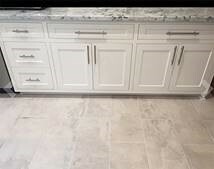 Instead of hiring a contractor, upgrade the kitchen backsplash with peel and stick wall tile. Tic Tac Tiles Anti-mold Peel and Stick Wall Tiles are highly rated on Amazon, and you can purchase 16 square feet of coverage for $22.98. 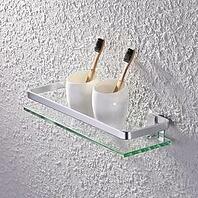 Install a polished looking shelf in the bathroom for extra storage. Having ample storage is key to most tenants. The KES Bathroom Shelf is neat and modern looking. Not to mention, it provides additional storage for only $16.20. Want more property upgrades? Check out our "Property Upgrades" section on our blog.